Skip the base RC 300 and go for tried-and-true V-6 power with the RC 350, available in both rear- and all-wheel drive. 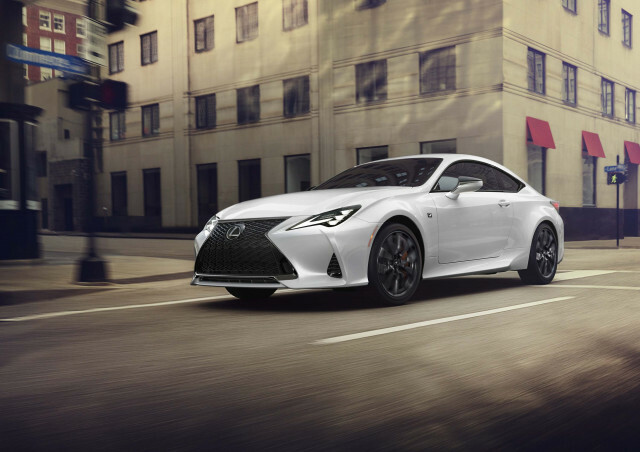 Or go all-in with the RC F.
The 2019 Lexus RC goes up against the Germans in the luxury sport coupe segment, but heaps of visual appeal and comfort help it stand out. For 2019, the RC gets a slight refresh with new styling cues, features, and a few performance tweaks to up the excitement. The front fascia is updated to echo the LC 500 flagship coupe, and new headlights and taillights add some visual intrigue. Lexus has also swapped in new springs and shocks and given the turbocharged 2019 RC 300’s engine control unit an upgrade as well as a power steering software update. The interior gets a few minor touches too, including Apple CarPlay compatibility (finally) and Amazon Alexa support. With visual updates including the much-improved headlights and taillights, the RC remains the most visually exciting coupe in its competitive set, with more angularity than its reserved German adversaries. Inside, the RC’s interesting cockpit design sports high-quality materials, but the tiered design is hit-or-miss for many. While we’ve yet to get behind the wheel of the 2019, updates to the suspension, steering software, and engine tuning should go a long way to make an already exciting sports coupe even sharper, especially with the F Sport handling and appearance package. Base RC 300 models have a turbocharged four-cylinder that’s a bit down on power, but the RC 350 makes up for it with a strong V-6 and 0-60 mph times in the sub-6 second range. Lexus’ answer to the BMW M4 and Mercedes-AMG C63 is the RC F. It’s heavier, but its 467-hp 5.0-liter V-8 makes up for some of its portliness. The RC F’s adaptive dampers and limited-slip rear differential help give it enthusiastic handling, whether on a track or snaking through a country road. Front seat comfort is still superb, and seat options get more bolstering the higher you climb the range. The rear seats are mostly there for looks, and adults will have a hard time fitting comfortably, so they’re best used for storage or folded flat to increase the RC’s modest trunk space. 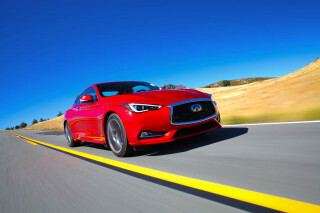 Though the 2019 model hasn’t been evaluated yet, the 2018 RC was an IIHS Top Safety Pick+ award recipient, boasting perfect scores all around and superior front crash prevention technology including forward collision warning, automatic emergency braking, and adaptive cruise control, all of which are standard on every RC. Options include leather upholstery, a moonroof, navigation, Mark Levinson premium audio, cooled seats and more. The 2019 Lexus RC maintains its visual intrigue with a few updates, and remains a style standout. Right up front, the “spindle grille” is the RC’s most prominent feature, now flanked by revised headlights with the recognizable checkmark LED running lights still intact. 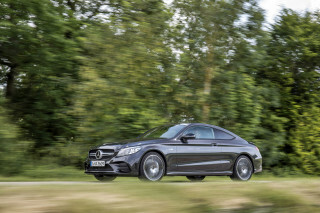 The front fascia gains a few other tweaks, and the long, muscular hood emphasizes this coupe’s sporty intentions. From the side, the RC can look somewhat thick—and it is one of the heaviest vehicles in its segment—but the overall design is proportional and tapers to a slight ducktail at the rear. Inside, the RC is more straight-edge than wild-style, with big horizontal elements that dominate the dash including an upright infotainment screen which is controlled by a touchpad on the center console that looks out of place. The front seats provide plenty of visual intrigue with dramatic stitching patterns, especially on the more muscular F Sport model, and can be had in a couple of interesting hues. The RC F’s styling isn’t much different from the F Sport, which is either a boon for those who want to go incognito or a bummer for those seeking even more visual flair. We’re in the former camp—it looks just right to our eyes. Overall, the RC is stylish without being extreme, and it should be as the brand’s compact sport coupe is now overshadowed by the space-age flagship LC 500. Adaptive steering and suspension aren’t must-haves, but any Lexus RC is fun to drive. The 2019 Lexus RC has a confusing naming structure, but is best served with either flavor of V-6 instead of the turbo-4. 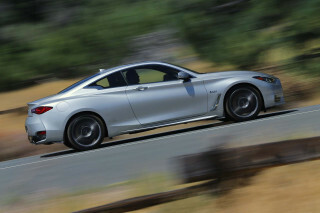 Confusingly, the base coupe was renamed RC 300 last year from 200, and is powered by a 2.0-liter turbocharged four-cylinder with 241 horsepower and 258 pound-feet of torque with power sent to the rear wheels through an 8-speed automatic, the only transmission available across the range. Perhaps even more confusingly, the all-wheel drive version of the RC 300 gets a 3.5-liter V-6 despite sharing a name with the turbo four, but provides superior performance with 260 hp and 236 lb-ft of torque. Finally, the range-topping RC 350 uses a considerably more potent version of the same V-6 in the RC 300 AWD, which makes 311 hp and 277 lb-ft of torque, and can be had with either rear- or all-wheel drive. The RC’s all-wheel-drive system has a fixed torque split of 30/70 percent between the front and rear wheels. Unfortunately, the song of the V-6 is canceled out by loads of sound deadening, but the RC can hustle along to 60 mph in less than 6 seconds to a top speed of 143 mph. For 2019, Lexus has given the RC new springs and dampers, adjusted the ECU tuning of the turbo engine, and has tweaked the power steering software, all of which point to improved handling and engine performance for what was already a capable car. The 8-speed automatic shifts smoothly but can be a bit overwhelmed when asked to do too much.e can’t help but think a manual transmission would make this car more fun if one was available, but the market for a row-your-own Lexus is likely slim-to-none. In terms of ride, the RC is geared more for comfort than corner carving, but splits the difference nicely and sports steering that is acceptably quick, if not on the light side. Adding the F Sport package adds stiffer springs, 19-inch wheels, adaptive dampers, a Sport+ driving mode on top of Sport, and plenty of visual touches to up the excitement, as well as some rear wheel steering above speeds of 50 mph to help maneuverability. In the RC F, a 5.0-liter V-8 pumps out a hefty 467 hp, which zooms it to 60 mph in about 4.4 seconds. A standard limited-slip rear differential, sticky Michelin Pilot Super Sport rubber, and traction control modifications including a dramatic “all off” mode elevate the RC F.
The 8-speed automatic in the RC F fires off faster shifts and mates well to the V-8. 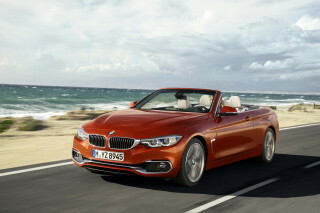 Its manual mode hangs onto gears longer and lets drivers swing the tachometer needle all the way to redline. We’re happy with the limited-slip rear differential, which weighs less than the torque-vectoring diff in other RCs. It allows for better control of the RC’s tail end on a track, even if the hefty curb weight is hard to ignore. The RC F’s electric steering builds up well, which makes up for limited feedback. On road, the RC F’s adaptive dampers cushion the blow from its 19-inch wheels. Big Brembo brakes bring the RC F to a halt. It’s a different driving experience than BMW’s M4 and Mercedes’ C63, but the RC F holds its own. The 2019 Lexus RC is best used as a two-person cruiser, as it’s plenty comfortable up front but miserable in back. Compact luxury coupes aren’t titans of practicality, but the 2019 Lexus RC is a livable vehicle for no more than two passengers. The RC is best used as a two-person vehicle, as the front seats provide plenty of comfort, space, and amenities no matter the trim level. Stepping up to the F Sport yields supportive leather buckets with plenty of bolstering that can fit any size of occupant, and a tilting and telescoping steering wheel make finding the right driving position a breeze. The RC can even be had with heated and cooled leather seats, welcome features in almost any climate. The back seats, however, are mostly useless for adults, and are better served as additional storage shelves. Thankfully, they do fold down and add more length to the modest trunk, which has 10.4 cubic feet of space. In terms of fit and finish, its typical Lexus fare, with excellent material quality despite a few overlooked details such as the infotainment system controller, audio controls, and a hint or two of cheap plastics. The 2019 Lexus RC combines great crash test scores with standard safety tech for a winning combination. While the 2019 Lexus RC hasn’t been fully crash tested yet, its past accomplishments and great standard tech bode well. The federal government’s NHTSA hasn’t crash tested the NHTSA before, but the RC did receive the Top Safety Pick+ award from the IIHS last year for perfect scores and “Superior” crash prevention technology, and should likely continue that streak for 2019 with minimal updates. 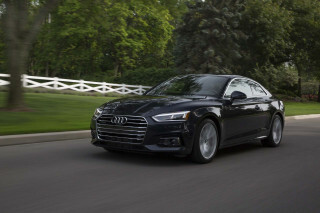 A rearview camera is standard, as are forward-collision warnings, automatic emergency braking, adaptive cruise control, and automatic high-beam headlights, while blind-spot monitors are curiously optional. All-wheel drive is also a confidence-inspiring option for buyers in climates with snowy weather, though each of the RC’s competitors offers it as well. The addition of Apple CarPlay keeps the 2019 Lexus RC’s tech relevant, while several appealing options remain. The 2019 Lexus RC’s changes are mostly visual, but thankfully it gets an important tech upgrade to go along with them. The base RC 300 costs around $41,000 and has plenty of standard features, including a full suite of active safety technology, synthetic leather upholstery, automatic climate control, LED headlights and taillights, heated front seats, 18-inch wheels, keyless entry and ignition, and Bluetooth phone and audio streaming. While the Enform infotainment system is long in the tooth and uses a frustrating touchpad interface, it thankfully offers Apple CarPlay and even Amazon Echo support this year, a welcome addition and one that keeps it from drawing too much ire . A 7.0-inch screen is standard, while RCs fitted with navigation get a 10.25-inch display, though the graphics look dated no matter which unit is fitted. Options packages allow buyers to make the most of their RC, with upgraded wheels, ventilated seats, blind spot monitors, a moonroof, unique upholstery, and Mark Levinson premium audio all offered at various price points. The F Sport package dials up the visual intensity along with some sportier hardware, and adds more aggressive seats and an extra driving mode. RC Fs cost about $65,000 and offers similar options to the RC F Sport. Tick all the options and the RC F runs about $81,000. If you’re not going to go all-in with the RC F, an RC 350 with the F Sport package and a few other options makes a strong statement at about $52,000. The 2019 Lexus RC can be thrifty, but versions are thirsty. There’s always a price for style. When it comes to the 2019 Lexus RC, that’s its mediocre fuel economy. The RC 300 with all-wheel drive uses a V-6 engine that lowers those figures considerably: 18/24/21 mpg. But we’d bypass that version anyway and go for the RC 350 at 20/28/23 mpg with rear-wheel drive and 18/24/21 mpg with all-wheel drive. The RC F is a guzzler, but tall gearing from its 8-speed automatic helps it earn a respectable 16/25/109 mpg—for nearly 470 hp, that’s not bad. Caveat: The ratings above are mostly for 2018 models. We’ll update this space when we know more about the the 2019 RC.